What Happens When Six Canadians Meet a German, Korean, Brit, and a Nigerian in Ghana? The answer: you get an insight into today’s reality of global mission and a strategic God who moves people for His purposes. While space does not allow me to tell all the stories of our international encounters in Ghana, I can say this mission trip with five other ISMC national team members significantly impacted me and shifted the realities of my missionary thinking. Many of those who I spoke with about this trip were surprised that one of the top supporting churches for ISMC’s ministry is in Ghana. 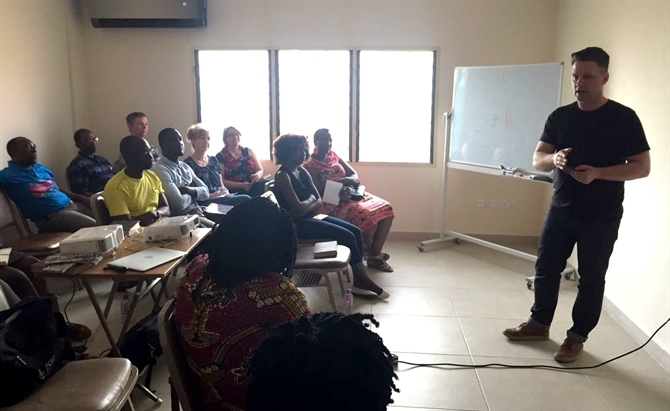 Six hours after arriving in Accra, I found myself in a room where strategic Ghanaian leaders were being trained to empower ISM in their churches and campuses. Ghana has over 15,000 international students—including Canadians! The University of Ghana has students from the same Japanese university (Soka) that we minister to in Vancouver! We were surprised to meet Hannah in our training sessions. A seminary student from Germany doing her practicum in Ghana, she said she came to faith as an international student in the States and was willing to welcome returnee students in Germany. Hannah is a living example of how missions is from everywhere and to everywhere. Another significant moment was visiting the first Methodist Church in West Africa in Cape Coast, Ghana. As a team, we went there to pray for Ghana to be a missionary sending force. Our first encouragement: seeing the church packed for a regular prayer meeting. This church was not just a historic site, but a vibrant local church. While there, I was impressed to hear that Rev. Thomas Birch Freeman is widely considered as the father of the Methodist churches in Ghana. He also established them in Nigeria. What makes his story so compelling to me is that he was a returnee—his ancestry is from Ghana and it was due to this that he survived in his missionary work; remarkable, because the first missionaries died within six months. I took it as an affirmation to continue reaching internationals and sending them back to their home countries so they too will survive and thrive in ways no foreigner can. I have now worshipped in churches on six continents. Little by little I get to taste, see, and experience what Revelation 7 shows us about every people group gathering around God’s throne in worship. Throughout my Ghana experience, a thought regularly occurred to me: Jesus Christ is the same yesterday, today, and forever. The same here, there, and everywhere!